Each five-pack of VIP E Cig cartridge refills is compatible with your VIP Starter Kit and allows you to try a unique and originally flavoured alternative to your standard tobacco. Designed to be easy to use and mess free, swapping cartridges could not be easier as they click into your VIP E Cig’s battery. Unique and an acquired taste, British Gold Cartomizers by VIP create the intense flavour of burning tobacco. There’s an authentic smokiness to these refills which may appeal to new vapers or simply anyone who loves the burning sensation that comes with tobacco. One of the most popular flavours in the VIP range, you can enjoy your British Gold Cartomizers in 20mg or 16mg nicotine strength. I have sampled a number of other vaping products and find these to be the closest in flavour to a real cigarette. The only issue I have with them is the battery life . These are the closest thing to smoking, just fantastic. Since using these products I have not smoked a cigarette for 4 years. Result. If you want to give up the tar and rubbish but still need the nicotine hit then this is the product for you. Pleased with British Gold cartomizers, satisfaction all the time. Great product. Have been using these for three years and find them a good substitute for real cigarettes. I was spending approximately £50 a week on cigarettes l now spend £31 every 5 weeks on VIPS. Apart from the money that I am saving they are much better for my health. Excellent value. I used to smoke Lambert and Butler or Richmond and the taste is comparable. Have been vaping for three years now ans have never wanted a cigarette. At last! An ecigarette that tastes like a real cigarette! 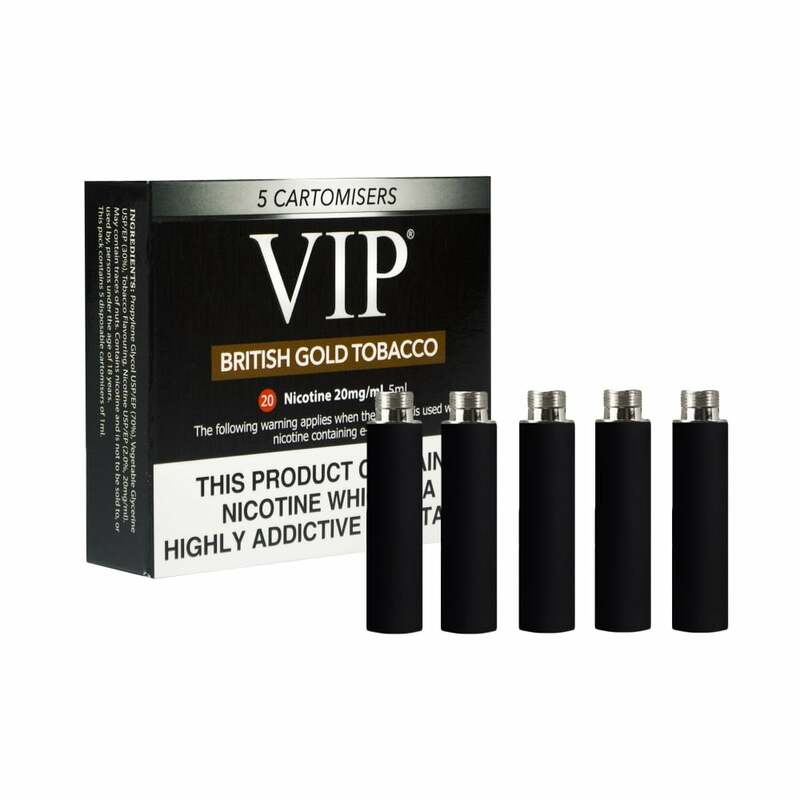 VIP cartomisers really last well, and are fine for flavour and nicotine strength. Have tried others, but only buy these now. battery units are good too. Very impressive speedy delivery. Easy to use website. These cartridges are good although they only last a couple of days and are milder than expected. They have kept me off the cigs though so overall happy with the product and will be purchasing again. Excellent product; superb price and second to none on delivery price and speed of arrival. Would certainly repeat purchase and would not hesitate in recommending to family and friends.